Effective from 9 January this year, the company formerly known as Tognum AG will operate under the name of Rolls-Royce Power Systems AG. Effective from 9 January this year, the company formerly known as Tognum AG will operate under the name of Rolls-Royce Power Systems AG. This is not a change of ownership - simply a decision by equal joint owners R-R and Daimler to discard the name Tognum and (with the full agreement of Daimler) trade only under the name Rolls-Royce, which will also handle all operational matters. Since March 2013, the engines, propulsion systems and distributed energy specialist has been a wholly-owned subsidiary of Rolls-Royce and Daimler via a joint venture. The Tognum group of companies with MTU Friedrichshafen GmbH, formerly a subsidiary, as the core company has been consolidated in the Rolls-Royce Group's results since the beginning of 2013. The regional companies will also operate with immediate effect under a new name: Tognum America Inc will now operate as MTU America Inc and Tognum Asia Pte Ltd, Singapore, will operate under the name MTU Asia Pte Ltd.
‘The new name Rolls-Royce Power Systems reflects the close industrial ties to Rolls-Royce. At the same time, our owners Rolls-Royce and Daimler have clearly affirmed their commitment to our traditional brands of MTU, MTU Onsite Energy and L'Orange,' said Dr Ulrich Dohle, who has been chairman and CEO of the company since July last year. 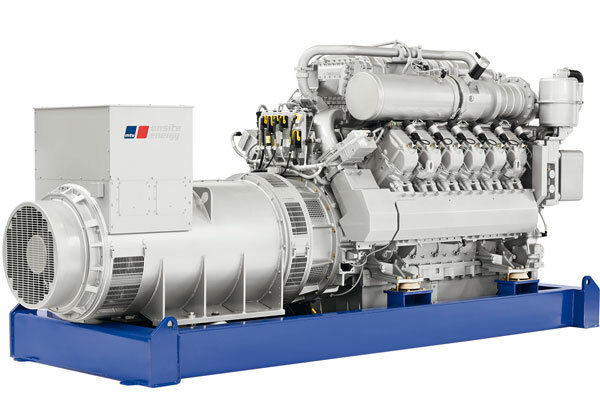 The product portfolio includes MTU brand high-speed engines and propulsion systems as well as diesel gensets for emergency, base load and peak load applications, in addition to cogeneration plants based on gas engines or gas turbines. The Norwegian subsidiary Bergen Engines manufactures medium-speed engines for marine and power generation applications. L'Orange rounds off the portfolio with fuel injection systems for large engines. MTU has made a number of important moves recently. Under an agreement signed at the end of October 2013, MTU Onsite Energy and regional Polish energy supplier Kogeneracja Zachód will form a partnership for the supply and maintenance of CHP plants. The first stage involves the supply and maintenance by MTU of CHP plants producing a total of 12 MW of electricity for the three Polish cities of Bialogard, Szamotuly and Leczyca. In further projects over the coming years, both companies plan on working exclusively with each other to supply small to medium-sized Polish cities with 'green' energy from combined heat and power plants. 'For us, Poland is a strategically important market in which we will be offering clean and energy-efficient CHP plants for the generation of electricity and heat,' commented Dr Rainer Hönig, executive vp of the MTU Onsite Energy division. Kogeneracja Zachód specialises in converting local coal-fired power stations into combined heat and power plants, which it then operates. Its products bearing the Rolls-Royce brand MTU Onsite Energy are now to be marketed in Saudi Arabia by distributor Sawary Energy. The agreement spotlights marketing rights for 60 Hertz diesel generators producing up to 3250 kVA. From its locations in Riyadh, Jeddah and the Eastern Region and a service team of over 300 engineers, technicians and other staff, Sawary Energy has concentrated since 1975 on marketing diesel generators, and is able to offer its customers a comprehensive and reliable service network. In future, Sawary Energy expects to cover the increased demand for emergency, continuous and peak power in the Saudi Arabia marketplace by offering a range including MTU Series 1600, 2000 and 4000 engines as well as MTU Onsite Energy brand diesel gensets for distributed power generation. In November MTU and Westinghouse Electric Germany signed a long-term contract for strategic co-operation in the field of emergency power generation sited at nuclear power plants. Westinghouse Electric Germany is to give preference to MTU on projects in Europe, the Middle East and Africa.